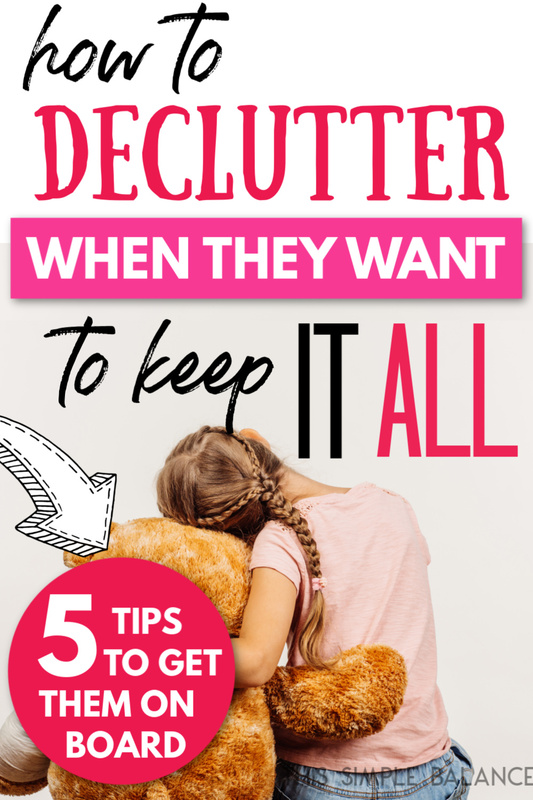 Inside: Are you trying so hard to declutter, but you have a child who won’t let go of anything? Minimalism with a sentimental child can be tricky. Try these tips to make it easier! Crap. What on earth made her think about that puzzle?! And 10 minutes before bedtime! I panicked slightly. During our hectic move, the mod-podged puzzle definitely did not make the “must keep” list. It was tossed in the trash without a second thought (we had no choice, promise). That’s when the sobs started. They continued for thirty whole minutes. All I could do was rub her shaking back gently. How on earth did this minimalist, very unsentimental mom got stuck with a child this sentimental? In case that story didn’t clue you in, my oldest child is extremely sentimental. She associates objects with memories or with the people who gave them to her. She also has the urge to save things that are special to her in order to share her love of them with those closest to her. Just the other day, she walked into the kitchen and announced, “Mom, you know my Ramona books? We can keep them to hand down to my children and grandchildren and great grandchildren!” No joke – unprompted, and so NOT like me. These days, I declutter things faster than you can say, “declutter.” If I suspect I am sentimentally attached to an object we don’t need or use, I ruthlessly dig to find the root of my attachment, say a quick prayer of thanks for how that object was useful to us in the past, and get rid of it. For my daughter? It’s not that easy. My jaw dropped, and I mumbled some kind of “maybe” before kissing her goodnight. While I do not relate to my daughter’s deep attachment to material things, I do advocate for working with your child’s personality and trying to make decisions that work for the entire family. I know that minimalism helps everyone in our family, even if my kids don’t always agree or understand. But I don’t want to steamroll my daughter, forcing minimalism on her with my parental authority. I want her to know that we value who God made her to be; that her feelings are heard, they matter, and we take them into account. So how do you help your sentimental child to declutter and to embrace minimalism? I’ve learned a few things along the way that make it easier. We try to share with our kids why we do what we do as much as possible. It’s not possible all the time, but we do it whenever we get the chance. If we explain our why, we meet less resistance. I often find that explanations also contribute to a “our family is a team” mindset. Explain how minimalism benefits you and the whole family. When we have fewer things in our house, mommy has more time, is less stressed, and enjoys life more. Point out how much effort cleaning up and organizing so many things takes. Share how clutter makes you feel (stressed and unhappy). Some personality types are not as affected by clutter, but you likely have at least one other person in your family who is blatantly negatively affected by clutter as well. Your kids probably don’t fully appreciate the calm and joy an orderly, clutter-free house can bring, so it’s your job to verbalize those feelings and help them understand. 2) With older children, invite them into the process. Even after getting rid of so much stuff, decluttering is never a finished job. I still seasonally declutter toys and the kids’ rooms. By saying out loud the exact thought process I use to declutter, I give her a life skill, and we get to have a good conversation about it. The conversation gives her the space to process her feelings. By the time she finishes, she is often ready to give up the item voluntarily. If she isn’t ready, we don’t get rid of it. Period. Instead of being adversaries (me, the mean mommy getting rid of all of her stuff), she becomes an ally in the process. 3) Set boundaries for sentimental items. Each of my kids has a special bin where they can keep sentimental items, things that are special to them. These items range from birthday cards to Happy Meal Toys to their leaf collection. They get to choose what to keep. When the bin is full, they need to sort through it and decide what goes and what stays. Stuffed animals can be another problem area for many parents. For my kids, as long as their stuffed animals stay on their beds, they can keep them. When I start finding stuffed animals all over the house, I remind them of the rule, and where those stuffed animals will end up if I keep finding them. Usually one reminder is enough. With crafts and art projects, I have a simple solution for dealing with kids’ artwork. On the whole, I decided that crafts generally drive me crazy, and I just don’t do them anymore, guilt-free. Instead, I encourage lots of drawing and artwork. Any crafts that do happen to come into the house (usually via the sentimental child) can stay on top of her bookshelf or desk. Those I find outside of her room get put in the artwork bin to deal with later. “Out of sight, out of mind,” and the easier to get rid of later, when the memories fade. 4) Give her an incentive to declutter. When the kids protest items going into the yard sale or donation box, I try to have an incentive in mind. For example, we still need to purchase bikes for our kids. I explained that the yard sale proceeds will go to new bikes. 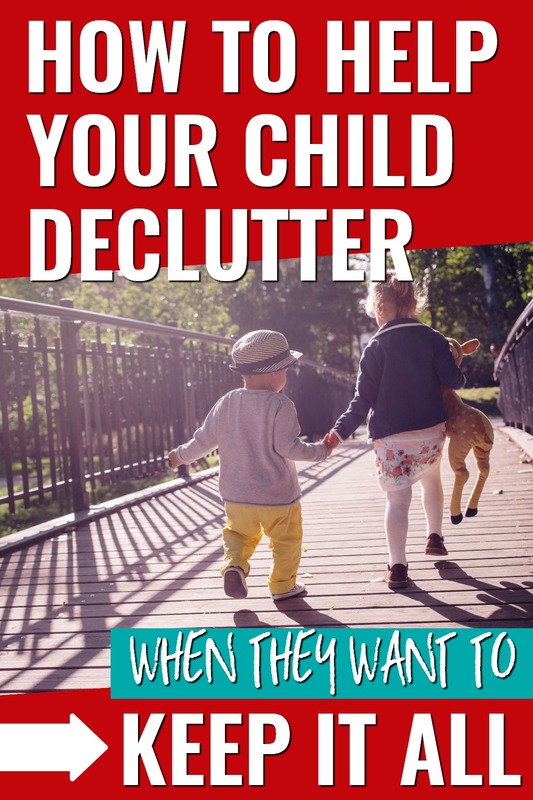 This usually helps get them on board with decluttering. If you don’t really need more “things”, you can make a special experience your incentive (a very minimalist thing to do). Anything that you don’t ordinarily do will work: a special trip, a movie in the theatre or dinner out are just a few ideas. 5) See her sentimental attachment as a strength. When we view the world through one lens, we tend to see differences as weaknesses. Some minimalists might see sentimentality as a weakness. I disagree. My daughter has a big heart and loves people. She keeps things that remind her of the people she loves and the experiences she has had with them. Additionally, one of her love languages is likely gift-giving. This is a strength! It’s my job as a parent to help her find alternative ways to use that strength. Perhaps we make time to write more cards to connect with the people she loves who lives far away. Maybe it’s planning an event for everyone she loves instead of giving them more stuff. It’s also my job as the parent to explain to extended family and close friends that we are pursuing minimalism and simple living as a family. You can ask grandparents to give gifts like museum passes, special dates, and useful items for birthdays and Christmas gifts. We use a public Amazon wishlist for Christmas especially to share the items we truly need. 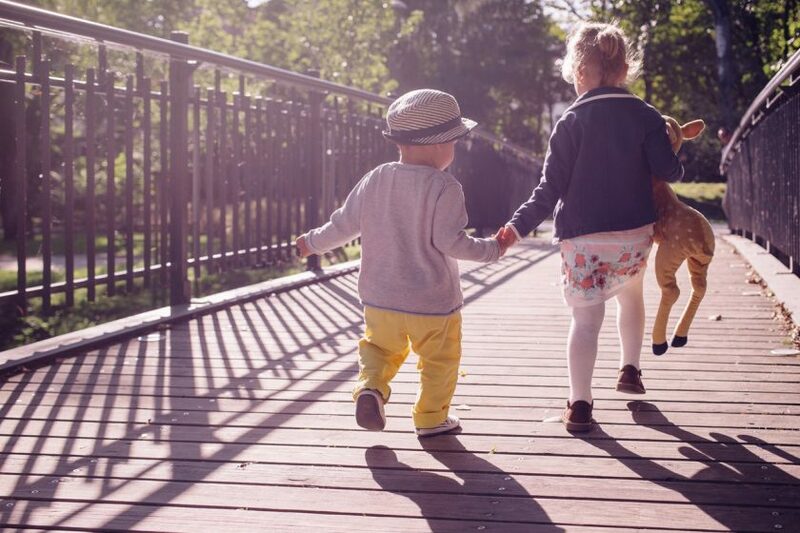 The sentimental child and the minimalist parent doesn’t have to be a horrible mismatch, and it is possible to declutter with a sentimental child. With a little creativity and intentional parenting, minimalist parents can help their sentimental child embrace minimalism, too. 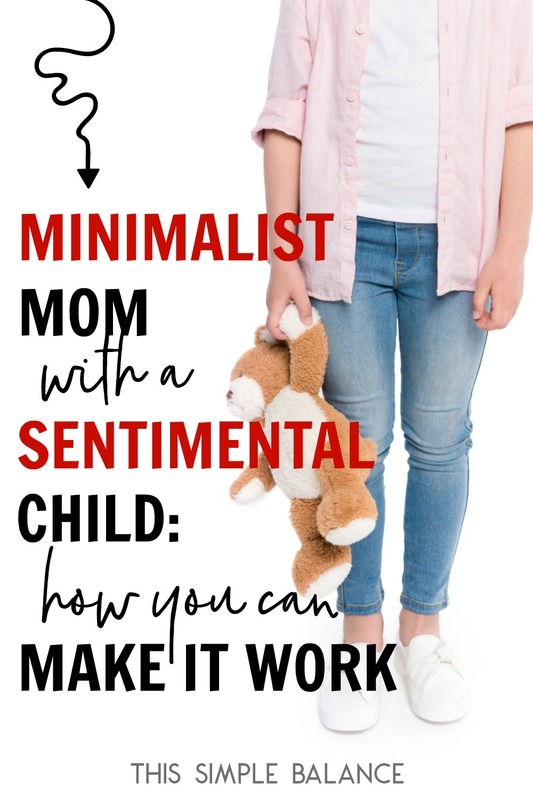 Your sentimental child just might become your biggest ally in minimalism. Clutter is a never ending struggle at our house and I doubt we will ever be “true” minimalist but I sure would like to be a lot less clutter than we are now. I am the type that cannot stand clutter. Stuff sitting around taking up space really bothers me. That doesn’t mean I don’t like “stuff”, I just think it should have it’s place. My daughter on the other hand is very sentimental. She loves everything, everyone and her stuff. She still reminds me of a Halloween decoration that I threw out 10 years ago! She has gotten a little better as she has gotten older. Her room is still full of her “collections” but at least she does keep it clean now. My husband also does not mind clutter. He doesn’t really collect anything but he does buy and sell “stuff” for a living so we tend to have a lot of things sitting (piled) up in the garage. I hate walking through it all but we cannot afford to build a building for it so I have to put up with it for now. Thank you for your tips. Some I have used and find they do really work (especially with my daughter). I think trying to find that happy medium when more than one person lives in a house is always a struggle but is the best we can hope for! This is such a great post! I’m sentimental and have two very sentimental kids. This makes decluttering an emotional challenge that tests me all the time! When decluttering my 5 yo daughters “drawings” I explained that she could pick three to keep and display or file away in her “keep folder” in the filing cabinet. She burst into tears because ALL of them were special to her, even the scribbles. She actually suggested that I take a photo of the ones bound for the recycling bin (smart girl!). So I have photos of my red-faced, hysterical child posing next to her artwork! Thanks so much. I have been somewhat a hoarder with minimalist intentions!! And my partner is messy and doesn’t see the clutter or mess and it doesn’t impact him as it does me. And we have two young sentimental children. This was really helpful and gave me some concrete tools to try out! Wish me luck! Only recently heard of this minimalist lifestyle. My question is – – if you truly don’t value things, why do you need to continually declutter? Why do you continue to buy more stuff that just has to be thrown away? Just trying to understand. Thanks for commenting Cherilyn! And no problem – I totally understand your question. Despite the perception, minimalists do value things. Minimalism is more about keeping the things that you truly do value – a common phrase is “Keep only what you believe to be useful and beautiful.” It’s about getting rid of all the rest, freeing your time and energy for what truly matters most to you. As for why you need to continually declutter, there are some things that are useful for only a season. Also, as I’m sure you know, things are constantly coming into our homes either through gifts or paperwork or expired medicine/toiletries or even random freebies like pens. It all can add up quickly, so you’re never really done decluttering, though the first time usually gets rid of the bulk of your clutter (depending on how thorough you are). As for buying more stuff, I think there are some things you will always need more of, but hopefully less frequently if you’re taking good care of them. Clothes wear out and things break. Our needs also change over time. I try to reduce the number of things we need to buy by using the library, taking care of the things we have, and simply doing without as long as possible (often what I think we “need”, we might just want!). When you have kids, this multiplies tenfold. Kid’s hobbies and interests are constantly changing, and the stuff kids need constantly changes as they grow – from clothes to books to toys. Then add additional kids and the numbers go up. Decluttering is pretty much constant when you have kids. I hope that helps!